The very sweet and thoughtful Beachlover sent me this. "Do you know the relationship between your 2 eyes? They blink together, move together, cry together, see things together and sleep together. Even though they never see each other, friendship should be just like that! Life is like Hell without FRIENDS. 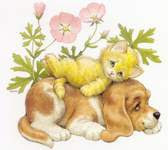 Its ‘World Best Friend Week’. Send this to your best friends to let them know you appreciate them. " Heaven is no fun without FRIENDS. Now, I would like to pass to my friends whom I made through blogging and also personally. I'm glad to have found all the blogger friends here including you, Gert. A true friendship is hard to find. That is a very meaningful and beautiful sharing. Thank you, Gert. Cat, I felt the same way too. Thanks for being my friend.